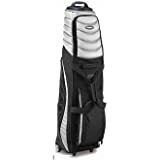 The BagBoy T-2000 Pivot Grip is a strong and practical golf travel cover which will fit a 48″ driver and a cart bag up to 10″. It features a very durable PVC back with an extra-high and skid-resistant ABS base to offer your clubs maximum protection. The travel cover is lockable and has a full wrap around main zipper. There are dual lift assist handles as well as a durable and padded carry handle and a moulded ID tag. The ergonomic patented Pivot-Grip® handle makes for more comfortable carrying by reducing strain on wrists and arms when transporting the bag in the cover.